Power Line Construction | Intermountain Electric Service Inc.
New power lines can bring power, infrastructure, and technology to out-of-the-way places. That’s why they’re such a huge asset to those with industrial and commercial projects across rural America. Intermountain Electric is the industry leader for power line construction in Wyoming and the surrounding areas — we’re here to design the perfect power solution for your project and make it a reality. We have experience with a variety of commercial and industrial verticals — there’s no project too big or too small. Schedule a free consultation or call us directly with any questions you might have. Design the perfect electrical solution. Our electrical engineers start the process by designing a perfectly calibrated solution that fits your electrical needs. Set up and test power lines. Our power line technicians will build power lines, test all necessary equipment, and keep you in the know along the way. If something goes wrong with your power lines due to a storm or malfunction, we’ll send out power line technicians to fix the problem quickly so you can avoid interruptions and frustration. 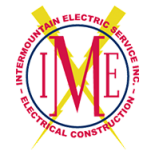 Intermountain Electric has provided Wyoming, Colorado, Texas, and the surrounding areas with power line construction and maintenance since 1975. That’s over 40 years of giving local businesses, schools, oil rigs, and other heavy industries the electrical services they need. Schedule a free consultation, or call us directly today.